Stonecreek Homes: H.14476 - Why build when you can move right in to this stylish, sophisticated and chic single family home in Stonecreek. The Charleston Grande is the largest single story floor plan offered in Stonecreek and this home is certain to please the most discerning buyer. This residence has been outfitted with several custom upgrades which include crown moldings, chair rail and picture frame moldings, wall wraps, custom lighting package, wood flooring in all bedrooms and the den, outdoor kitchen with tiled feature wall, Sunsetter retractable awning on the lanai, framed mirrors in all bathrooms, custom built-ins in the master bedroom closets, landscaping package and so much more. The gourmet kitchen boasts stainless steel applicances, quartz countertops, double oven, an island and a gas cooktop. Relax on the south facing lanai complete with heated pool, covered seating area and outdoor grill. Stonecreek offers a wide variety of amenities which include a resort style pool, lap pool, kids pool, spa, fitness center, indoor and outdoor basketball courts, beach volleyball, tennis & pickleball, playground, billiard room and a community social room. Schedule an appointment today! Stonecreek Homes: Hurry, don’t wait! Get this fully upgrade ranch style pool home on the lake for your entertaining and personal enjoyment purposes. With a sprawling floor plan this house has more than 3500 sf and $229,000 in CUSTOM upgrades which cannot be duplicated at this price today. (See attached supplement for details). Sought after Charleston Grande floor plan. Custom pool with custom "picture window" screened in lanai offers panoramic vistas. Stonecreek has some of the FINEST amenities Naples has to offer that include: Full-time activities director, resort-style and lap pool, spa, fitness center, 5 Lighted har-tru tennis courts, 4 pickle ball courts, an air-conditioned indoor sports complex, game room for billiards, splash park with wading pool, shading playground, beach volleyball, full-court basketball and more. This is SW Florida peaceful living with all the conveniences the most refined taste would expect! Stonecreek Homes: Stunning Shiraz floor plan located in the Highly Desirable Stone Creek. Enjoy the Breathtaking Nature Preserve Views and Beautiful Sunsets. This open floor plan features 5 bd rms, 5 full ba, Large Extended Loft, Family Room, Living Room and 3 Car Garage. With over 4,000 sf this home is perfect for Families and Entertaining. You will want to spend time enjoying the Spectacular Custom Salt Water Pool with Sun Shelf, Walk in hot tub, Fire bowls, Water Feature, Travertine Pavers, and Panoramic Screen Enclosure. This home boasts 1st and 2nd floor Laundry rooms, Crown Molding throughout, Hardwood Flooring is featured in Loft Area, Mstr. Bedroom and Stairs, High End Natural Quartzite Kitchen Counter Tops with large commercial sink and upgraded kitchen faucet, SS Appliances, upgraded Tempstar Ultra High Efficiency Inverter Air Conditioners, Navien On Demand Hot Water Heater, and Flexcore Coated Garage Floors are some of the many after market features the owner spared no expense. Stone Creek is one of the very few communities with Natural Gas and Low HOA Fees. Stonecreek Homes: New construction projected for June/July 2019 delivery. Located in Stonecreek by GL Homes, one of Naples hottest new developments featuring gas appliances as standard & zoned for "A" rated schools. An amazing resort-lifestyle included in the community. The 6.25 acre recreation site features a resort-style pool, lap pool, wet play activity center, whirlpool spa, firepit, lake overlook pier & pavilion, outdoor tiki bar with outdoor dining area, 5 clay tennis courts with shade pavilions, 4 pickleball courts, beach volleyball, full size basketball court, shaded tot lot, a party pavilion & much more. This Napa floor plan provides over 3,100 sq. ft. of living space in a single story home. Enter the long foyer with coffered ceiling into the spacious great room opens to the kitchen. The kitchen has a large central island, pantry & casual dining area. A flex room is next to the kitchen which can easily be used as a game room, large den or formal dining room. Experience ultimate luxury in the master suite with a generous master bath & closets that have to be seen to be believed. All 3 remaining bedrooms have walk in closets. Prices subject to increase without notice. Photos are of model. Stonecreek Homes: H.13584 No need to wait to build brand new construction in Stonecreek. Free furniture & decor package in this gorgeous lake-view popular "Carlyle" floor plan with 3 bedrooms plus large bonus club room (can be 4th bedroom)... Entertain in style with an open great room with wet bar, counter seating, breakfast nook, and a large formal dining room. The gourmet kitchen features an island, Quartz counter tops, glass tile back splash, GE Profile stainless steel appliances with range hood, and gas cooking! Enjoy the serene lake setting from your spacious screened Lanai, already pre-wired & gas line for summer kitchen, with plenty of room to add a custom pool. Make new friends at the fabulous Lifestyle Complex which includes a resort style pool, lap pool, 5 lighted Har-Tru tennis courts, 4 Pickleball courts, Tiki Hut, whirlpool spa, kids water play area, shade cabanas, billiards rooms, fitness center, indoor sports complex, social hall. This luxury lifestyle community is located in "A" rated school zone and just minutes from dining, shopping and highway access. Activities director, security, lawn care & irrigation is included with HOA fee. Be sure to check out the interactive 3D tour. Stonecreek Homes: H.13379 - New construction. Available for immediate occupancy. "Carlyle" floor-plan has 3 bedrooms and 3 1/2 bathrooms. Gourmet kitchen with stainless steel appliances. Large master bedroom with a luxurious master bath, his and her sinks, step in shower, roman tub and two generous walk-in closets. Stonecreek amenities will include indoor/outdoor basketball courts, fitness center, 2 pools, water pay area,party pavilion, tennis courts, beach volleyball and 4 Pickleball courts. All prices subject to increase without notice. Photos are stock/models photos and are not of the actual house. Stonecreek Homes: H.14298 Stunning home located on a desirable LAKE LOT on CULDESAC. Move right into this dream home with over $200,000 in custom upgrades, including 30”x 30” polished porcelain, custom paint, luxury lighting fixtures, custom built-in closets, and electric custom Hunter Douglas window treatments. This spacious open floor plan offers the convenience of your Master Suite on 1st floor, with remaining 3 bedrooms on the 2nd floor plus additional loft area. Entertain with style in this gorgeous kitchen boasting stainless steel GE Profile appliances with range hood, high-end kitchen cabinets, mother of pearl back splash, quartz counter top, and much more. Your outdoor retreat awaits with a fully fenced back yard, spacious lanai with custom outdoor kitchen. Stonecreek is a new sought after natural gas community featuring a spectacular lifestyle complex with a resort style pool, lap pool, spa, cabanas, tiki hut, tot lot & water play area, fitness center, 5 lighted tennis courts, 4 pickleball courts, billiards room, social room, and full time activities director. This exclusive community is located in “A”-rated school zone, and offers the convenience of shopping, and entertainment nearby. Stonecreek Homes: New construction projected for May/June 2019 delivery. Located in Stonecreek by GL Homes, one of Naples hottest new developments featuring gas appliances as standard & zoned for "A" rated schools. An amazing resort-lifestyle included in the community. The 6.25 acre recreation site features a resort-style pool, lap pool, wet play activity center, whirlpool spa, firepit, lake overlook pier & pavilion, outdoor tiki bar with outdoor dining area, 5 clay tennis courts with shade pavilions, 4 pickleball courts, beach volleyball, full size basketball court, shaded tot lot, a party pavilion & much more. This Shiraz floor plan features a formal living room & a family room both with sliding glass doors out to the lanai. The kitchen has a central island, walk-in pantry & casual eat-in area. A formal dining room is found next to the kitchen. There is also a mud room, bath & downstairs bedroom. Upstairs, the master suite has a walk-out to a covered veranda, walk-in closets & master bath has separate his & her bath spaces connected by a double entry shower. 4 additional bedrooms with 3 baths, loft & laundry room are also upstairs. Prices subject to increase without notice. Photos are of model. Stonecreek Homes: New executive 4 bedroom and 4 full bathrooms home on a cul-de-sac. Desirable western exposure with view of landscaping and preserve. Owner spared no expense with over $100,000 in upgrades, including all hurricane impact door and windows, privacy wall on patio, the kitchen appliances, countertops, backsplashes and lighting. Custom wood and wrought iron stairway feature and oversized brick paver driveway are exquisite accents that make this home exceptional. Stonecreek Homes: New Modern Living in North Naples Hottest New, Gated Community, STONECREEK! This "Merlot" floor plan home is being offered pre-construction and IS READY NOW!!! Situated on a private lot, this home has an open floorplan with 5 Bedrooms, 4 baths, AND Loft. With over $88,000 in upgrades, such as Level V Cabinets with Soft Close, Quartz Countertops in the Kitchen and Baths, Double Wall Oven, Upgraded Diagonal Tile, Wood Staircase, upgraded Carpets, second floor balcony/lanai, and more! Stone creek is located just north of Immokalee Rd, just 1.2 miles east of I75. The 6.25 acre recreation site features a resort-style pool, lap pool, wet play activity center, whirlpool spa, firepit, lake overlook pier and pavilion, outdoor tiki bar with outdoor dining area, 5 clay tennis courts with shade pavilions, 4 pickleball courts, beach volleyball court, full size basketball court, shaded tot lot, and a party pavilion. The Club includes a social hall, catering kitchen, indoor sports court, card room, game room, media room, and a fully equipped fitness center. Stonecreek Homes: Wonderful opportunity to purchase a highly customized Conrad in desirable Stonecreek! This stunning home has a long driveway and is ideally located on an oversize cul-de-sac lot near the clubhouse. Surrounded by lush, colorful, professional landscaping, this impeccable home shows like a model inside and out showcasing beautiful hardwood floors, rich moldings, and custom window treatments & trim throughout. The dream gourmet kitchen is light, bright and spacious with quartz counters, high-end cabinets, stainless appliances, GAS range, and new glass front "instaview" refrigerator. Desirable open floor plan with the kitchen opening to a family room that's perfect for comfortable family living or easy entertaining. Southwest exposure ensures a light and bright interior. Second floor features a versatile bonus room and a luxurious master bath with carrara marble counters. "A" rated schools and countless resort amenities include resort, lap & wading pools, har-tru tennis courts, basketball courts, fitness center, tot lot, social activities, beach volleyball and more. Upscale resort living near I75, beaches & within 2 miles of a new shopping center with a supermarket, shops and dining! Stonecreek Homes: H.13365 - New Construction - Move In Ready - Partially Furnished. The Cabernet model offers an expansive and elegant living space. This home features 3 bedrooms, 3 full baths and a Den or optional 4th bedroom. From the gracious foyer to the open kitchen with breakfast nook and semi-formal dining room, no detail has been overlooked. This is a fantastic home for entertaining. The master suite offers a sitting area, 2 large walk in closets and a master bath with separate sinks, soaking tub and walk-in shower. Tile in all the common areas and carpet in the bedrooms. The 3-car garage is a unique feature and has virtual uses. Stonecreek amenities will include indoor/outdoor basketball courts, fitness center, game rooms, hobby room, a resort style pool, spa, and lap pool, water pay area, tot lot, party pavilion, 5 lighted tennis courts, beach volleyball and 4 Pickleball courts. A full-time activities director will make this community active and social for all lifestyles once complete. Enjoy A-rated schools and a desirable North Naples location. Stonecreek Homes: New Modern Living in North Naples Hottest New, Gated Community, STONECREEK! This "Cabernet" POOL home is being offered pre construction, with an expected delivery date of JAN/FEB 2019. Situated on a private lot, this home has an open floorplan with 3 Bedrooms+Den, 3 baths, and a 3 car garage. With over $88,000 in upgrades, such as Level V Cabinets with Soft Close, Quartz Countertops in the Kitchen and Baths, Upgraded Diagonal Tile, upgraded Carpets, pool, and more! Stone creek is located just north of Immokalee Rd, just 1.2 miles east of I75. The 6.25 acre recreation site features a resort-style pool, lap pool, wet play activity center, whirlpool spa, firepit, lake overlook pier and pavilion, outdoor tiki bar with outdoor dining area, 5 clay tennis courts with shade pavilions, 4 pickleball courts, beach volleyball court, full size basketball court, shaded tot lot, and a party pavilion. The Club includes a social hall, catering kitchen, indoor sports court, card room, game room, media room, and a fully equipped fitness center. Stonecreek Homes: Why wait to build, when you can purchase this immaculate "upgraded and ready to move-in", two-story, very popular Chelsea Model. One year HOME WARRANTY. Lots of upgrades, which include 4 bedrooms, 4 full bathrooms, laundry on the second floor and a loft. The Master bedroom features his and her walk-in closets and amazing en-suite. This home is perfect for entertaining with a beautiful back yard, open floor plan, a great room, formal dining, casual dining, and a spectacular kitchen. The large screened lanai provides plenty of indoor and outdoor seating. Do you have Kids? Then you will love the Cul-de-sac location, walking distance to the Amenities Center with resort style pool, lap pool, spa, Fitness Center, outdoor and indoor basketball courts, play areas, 5 lighted tennis courts, 4 pickleball courts, Full-Time Activities Director. No kids? That is fine as well, this is a great diversified neighborhood. 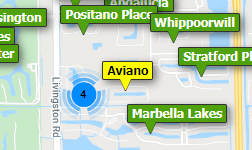 Located in Stonecreek, by GL Homes, one of Naples hottest new developments and fastest growing areas. Gas appliances are standard. Zoned for "A" rated schools, North Naples Location, minutes to I-75, shopping, restaurants and a short drive to Naples, white sandy beaches. Stonecreek Homes: H.14121 - New Construction completion date March/April 2019. "Chandon" floor-plan has 3 bedrooms + Den/Optional 4th bedroom and 3 bathrooms. Gourmet kitchen, granite countertops and stainless steel appliances. Large master bedroom with a luxurious master bath, dual vanity counters with sinks, step in shower, roman tub and two walk-in closets. Stonecreek amenities will include indoor/outdoor basketball courts, fitness center, 2 pools, water pay area, tot lot, party pavilion, tennis courts, beach volleyball and 4 Pickleball courts. All prices subject to increase without notice. Photos are stock/models photos and are not of the actual house. Stonecreek Homes: New Construction completion date March/April. "Tribeca" floor-plan has 3 bedrooms and 2 1/2 bathrooms. Gourmet kitchen with stainless steel appliances. Large master bedroom with a luxurious master bath, his and her sinks, step in shower, roman tub and two generous walk-in closets. Stonecreek amenities will include indoor/outdoor basketball courts, fitness center, 2 pools, water pay area,party pavilion, tennis courts, beach volleyball and 4 Pickleball courts. All prices subject to increase without notice. Photos are stock/models photos and are not of the actual house. Stonecreek Homes: E-Z-2-C!!! You'll want to see this modified 4 bedroom/3 bath "Tribecca" floorplan at Stonecreek first! Mr. and Mrs. "Immaculate" keep this home in beautiful condition and they added many extra features after the home was completed! Enter into an elegant foyer and you'll see the custom wall cabinetry and the water view in the distance. The heart of the home is a spacious great room open to the kitchen. The kitchen has ample counter space including a large counter bar. Across from kitchen is an expansive formal dining room. The master suite has two walk-in closets. The master bath features a roman tub, a walk-in shower and dual vanities. Stonecreek boasts a 6.25 acre recreation site with a resort-style pool, lap pool, wet play activity center, whirlpool spa, firepit, lake overlook pier & pavilion, outdoor tiki bar with outdoor dining area, 5 clay tennis courts, shade pavilions, 4 pickleball courts, beach volleyball court, basketball court, shaded tot lot & a party pavilion. The Club includes a social hall, catering kitchen, indoor sports court, card room, game room, media room & a fully equipped fitness center. Call now for a list of upgrades & to schedule a private showing! Stonecreek Homes: WHY PAY BUILDER PRICES AND ADDED FEES? WHY WAIT TO BUILD? MOVE IN TODAY to this exceptional Tribeca floor plan featuring 3 bedrooms, plus den, 2.5 baths, quartz counters, tile floors, with a stylish neutral palette are throughout this beautiful home. Spacious great room open to the gourmet kitchen featuring 42" solid wood cabinetry complimented by quartz counters, glass backsplash, stainless appliances plus GAS COOKTOP. The oversized island is perfect for entertaining. Master suite offers his and her walk-in closets, bath features dual sinks, walk-in shower and soaking tub. The StoneCreek Lifestyle Complex offers an abundance of activities you will enjoy, indoor sports, fitness center, a social area with outdoor covered patio, catering kitchen, multi-purpose studio, game room, billiards room, five tennis courts, picked ball, basketball courts, free-form resort-style pool with rock waterfall, a separate lap or exercise pool and a jacuzzi spa, separate children splash water park and playground and the poolside bar and cabanas make a perfect day! Stonecreek Homes: This house is a MUST SEE! Pictures do not do it justice. This home will not last long. Located on a beautifully landscaped private lot this meticulous 3- Bedroom plus Den home is one of the most popular floor plans in the highly desired Stonecreek community, the Tribeca. The home offers an open concept floor plan with kitchen, family room, and dining room all seamlessly flowing together. Over $50,000 in upgrades include European style hidden-hinge slow close cabinets, quartz countertops, crown molding and gleaming hardwood floors throughout the living Area. Located within a short walk from the resort-style clubhouse with 3 pools, tennis/pickleball courts, fully equipped gym, billiard room, social hall and so much more. This is a gas community! Homeowners are open to a lease back option. Stonecreek Homes: H.13975 - BEST PRICED SINGLE FAMILY HOME "Tribeca Model" in Stonecreek is turnkey furnished for your convenience! Priced BELOW new construction, and without the build time wait! Original owners and meticulously maintained, bright 3BD+DEN, 2.5BA is ready for your personal touches. Boasting a relaxing premium lake view on a quiet cul-de-sac street. Other notable features include impact windows/doors, soaring high ceilings, tile in living area, floor receptacle, additional wiring window treatments throughout, upgraded master bathroom, tray ceiling in master bedroom with (2) walk-in closets, gas-range/dryer/water heater, granite in kitchen and bathrooms, laundry sink in garage, screened lanai and much more! Stonecreek is a natural gas community. Recreation areas include a resort style pool/spa, lap pool with shade coverings, beach volleyball, tot lot, water play park, indoor sports complex, fitness center, game rooms, social hall, catering kitchen, in/out gathering rooms and much more! Stonecreek is located in North Naples with easy access to I-75, shopping, dining, a wide array of golf courses, SW FL Beaches! Need professional assistance selling your property at Stonecreek Naples? Find out how an Area Specialist can help to generate more property exposure in order to get the most money for your investment in the least amount of time.